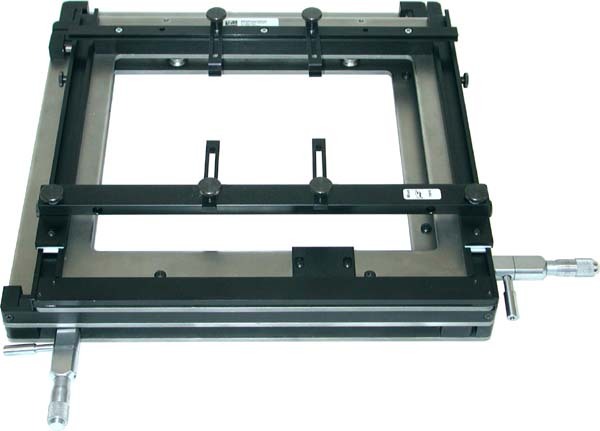 Can be attached to all X-KAR Bases or used as a free-standing X-Y precision positioning stage. Open Frame construction for use with under board pre-heaters. Quick approximate alignment in both axis with convenient half-turn blocking mechanism. 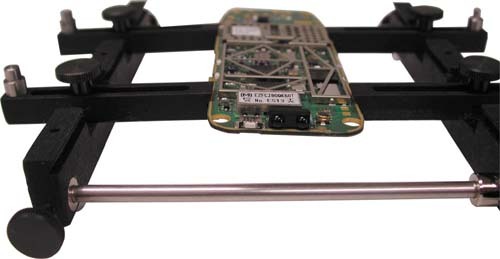 Fine, precise X, Y adjustment (up to 1/2" or 10mm) with micrometers. 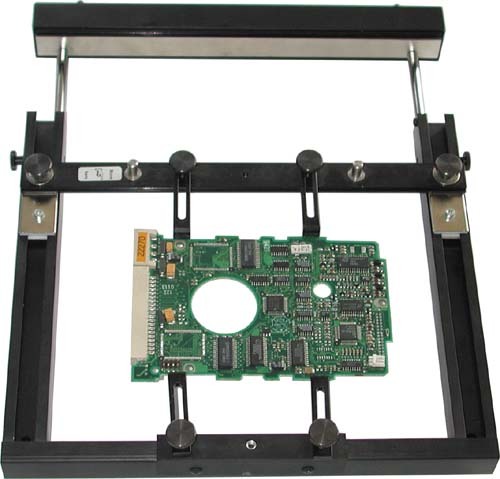 Spring loaded holding mechanism on one side of the board holder for easy replacement of boards. Mounting arms for irregular shape boards. 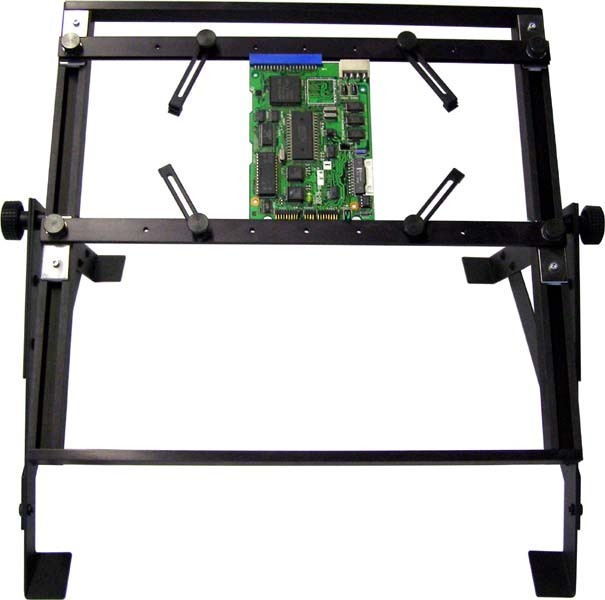 Can handle boards up to 10.3" x 16.1". 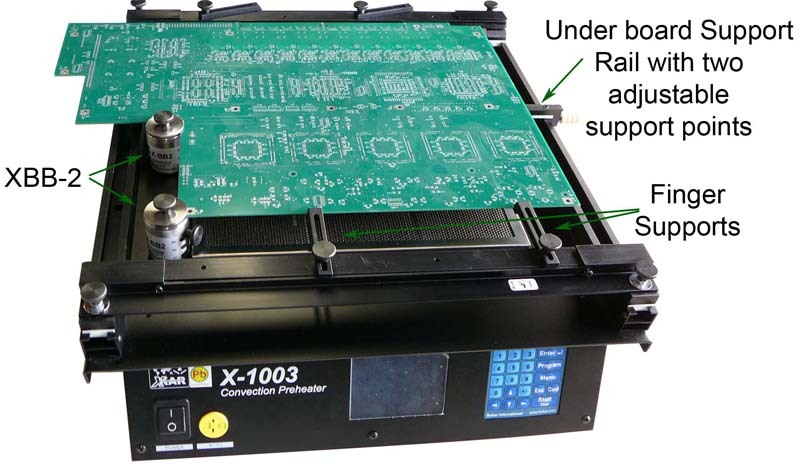 It has become the standard in the industry for hand assembly of circuit boards when the operator must work on the top and bottom of the board. 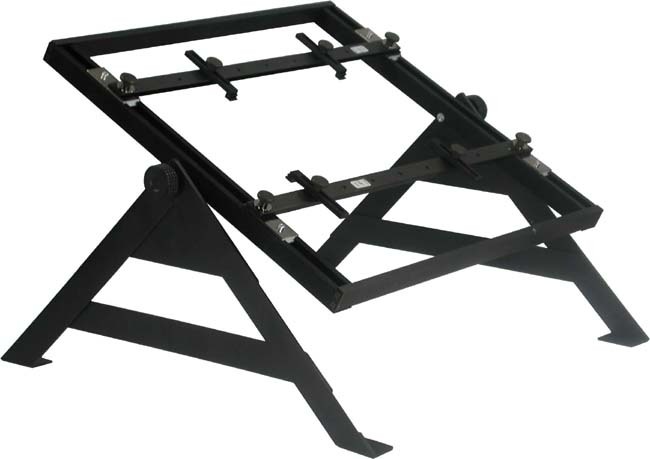 Includes four adjustable, universal arms to hold and support irregular shape boards. Can handle boards up to 12" wide. Spring Loaded Holding on one side for easy replacement of the boards. Unique, universal design for someone who handles variety of board sizes. Open Frame, to allow for bottom pre-heat. Universal PCB Holder. Handles regular shape, small and middle size boards and also irregular shape boards. 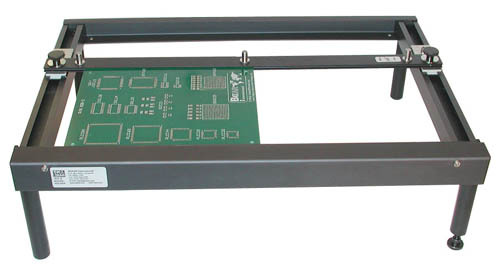 A board can be held by the sides or supported by four adjustable arms. The arms are reversible. One side has pins to hold the board via mounting holes and the other side has stepped groves to hold the board by the edges. XU-Mini is fully ESD. It is made from chromium-plated bronze to add weight for stability. 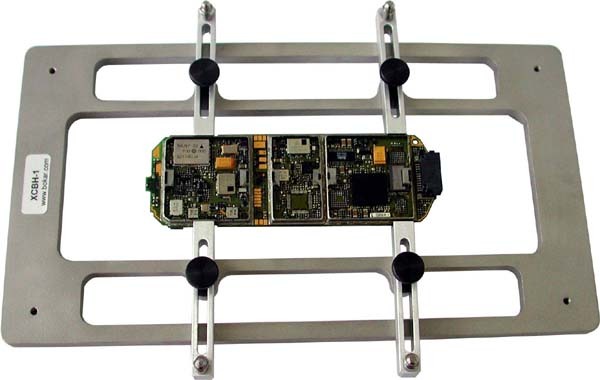 Can hold very small boards and the boards up to 10" (254mm) wide. Supporting sides are 5" ( 125mm) long. 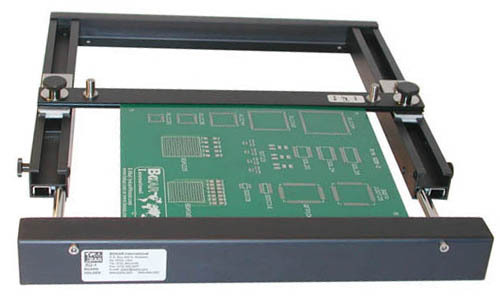 Open Frame, to allow bottom pre-heating. 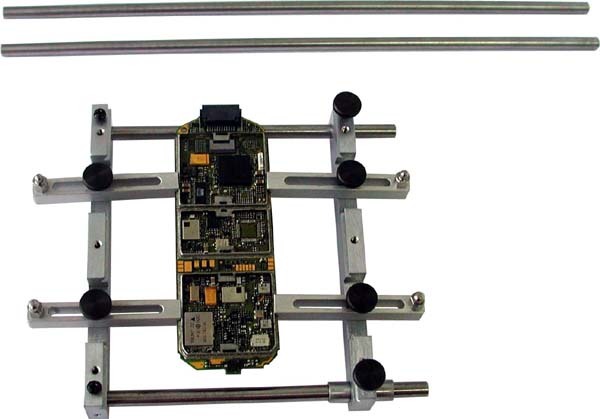 XU-Mini with sample PCB held in three different ways. Build for life. Stainless Steel ¼" Base and holding "Fingers"
Quick change over to the next board in rework of multiple boards of the same kind (important for Computer Mother Board Service Companies and others re-working same kind of boards. 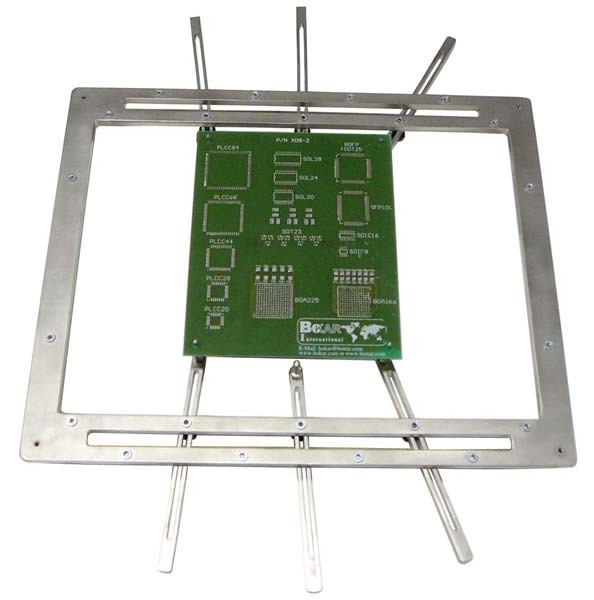 It has durable, stainless steel base and adjustable, multi-function arms to match most Cellular Phone Boards. 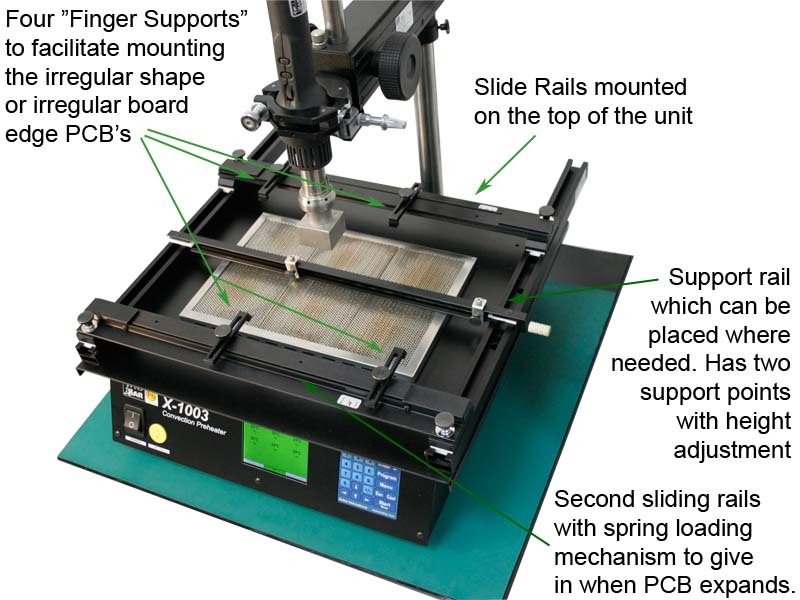 It includes a set of pins to match different mounting holes sizes and open frame to allow bottom pre-heating. 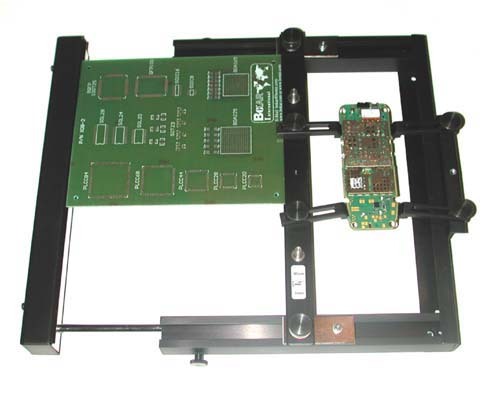 It is commonly used by the cellular phone repair centers where multiple boards need to be re-worked. 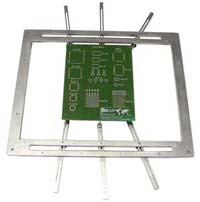 Stainless steel construction gives the board holder extra weight for stability. XCBH-1 is resistant to chemicals (fluxes, pastes, etc.). 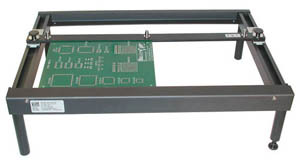 All X-KAR XU Series Board Holders are designed to have smooth movement of slides on the rails to minimize board insertion time. 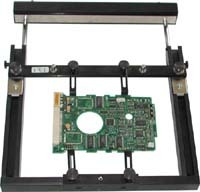 Spring-loaded holder on one side further enhances board placement. They are retractable to save space when working on smaller boards. 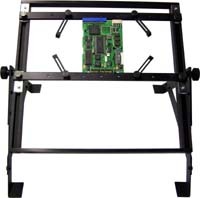 This extra large Board Holder was developed for customers who must handle very large boards. 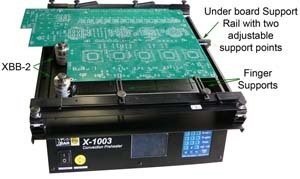 An additional rail was added for better board support.